This AMT/Ertl model is 20 inches long and is in scale with the AMT/Ertl refit Enterprise. 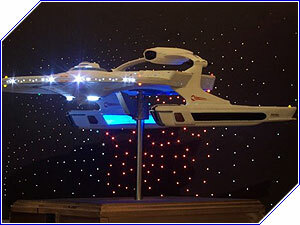 This model can be built, painted and/or fully lit to look exactly as it did in the movie 'Star Trek II: The Wrath of Khan'. The model can be built with or without the battle damage. Full Aztec paneling will be applied. Approximately 70% of the windows are drilled out and will be lit along with blinking formation lights, navigation lights, and unique spotlights, if desired by the customer. NOTE: Since this model and the AMT/Ertl Enterprise are of the same scale, we also offer both models together in a battle scene diorama from 'Star Trek II: The Wrath of Khan'. Please call to discuss this option. For New & Additional Photos, Click Here!